If you’re an endurance cyclist, you’re probably obsessed with maintaining or improving your Functional Threshold Power (FTP). This measure of fitness approximates how much power you can maintain in a long, steady effort equivalent to racing one-hour to full exhaustion. But instead of riding a full hour (which would be unbearable to most of us outside of a race), we approximate FTP by using a 20-minute or eight-minute all-out effort. The problem with FTP is that, even if it did capture “one-hour power” (which is does only for truly hardened elite cyclists), it doesn’t give the full picture of a cyclist’s fitness. Even a one-hour race isn’t perfectly 100% aerobic and the anaerobic system still contributes to the overall power output. FTP also doesn’t capture how strong (or weak) an athlete’s anaerobic system is. While this may not seem like a big deal to long-course athletes, it does have a big impact on how different workouts affect different athletes. For instance, two athletes can have the same FTP, but one athlete is a long-course specialist with a crappy sprint and the other one has a lot of short-duration power. They can both take on the same tough interval session (e.g. one-minute efforts at 130% FTP with three minutes recovery). That session would likely flatten the long-course athlete while being easily accomplished by the athlete with the better sprint. Don’t get me wrong– FTP is still an important measure. It’s just that we could improve on it if we knew an athlete’s full power-duration curve. If you subscribe to The Sufferfest, you may have taken the “4DP Test”– a cruel single test for measuring a few maximal efforts to create your power-duration curve. Products like WKO4 and Xert are far more merciful and just use your existing training data to identify your recent maximal efforts to develop your power-duration curve. Both products incorporate a lot of company-proprietary “secret sauce” for their data-modeling and analytics and it’s impossible to say whether one is better than the other. But if consistency is any indication of quality, both do a great job of being consistent with each other (e.g. my FTP approximations on both platforms is usually the same, with about 2-3 watts). For years now, the traditional measure of the quality and impact of a workout has been “training stress score” (TSS), which is based on a combination of power (as compared to FTP alone) and duration. Go harder or longer and TSS goes up. But because TSS only uses FTP, it doesn’t capture the full picture of how brutal a workout is for different athletes. Xert is a bit different from similar products on the market because it rates workout based on the overall “strain” (as opposed to “stress”) that goes into a workout and then quantifies that strain using a proprietary Xert Strain Score (XSS). So what’s the difference between “stress” and “strain”? Probably not much according to the dictionary, but all the difference in the world of Xert. In a nutshell, the idea here is that, at any second in a ride, there is a certain maximum amount of work that can be done (Xert tracks that data too– and quantifies it as a number called “maximum power available” or MPA). The closer an athlete’s power is to MPA, the greater the strain. But quantifying that strain means knowing a bunch of things, such as how much strain the athlete has already done (because this lowers MPA) and how good the athlete is at producing power at different power outputs (which requires knowing the athlete’s entire power duration curve and not just FTP). Tracking MPA throughout a workout has some other cool ramifications. For instance, if your power curves ever intersects your MPA curve, you’re at maximum effort. Because it’s impossible to have more than maximal power, if you can exceed your MPA, then something in your fitness (e.g. FTP, maxVO2, etc) has improved and so your metrics need to be recalculated. Xert calls such events “breakthroughs” for good reason– you’ve broken through your ceiling and Xert will raise that ceiling. Tracking MPA also means that you can predict the level of fatigue that a workout is likely to generate– at least for shorter workouts (longer workouts can generate a ton of fatigue without the power curve coming near the MPA curve). Xert lets you leverage this knowledge of your unique physiology in its Workout Designer. This is a pretty straightforward tool that lets you plot out your workouts and see who much impact they have on MPA. At least for shorter workouts (i.e. less than 90 minutes), this works great. For instance, not sure if a set of 6 over-under intervals of 5 minutes at 95% and 105% FTP will leave you flattened given your current level of fitness? Just pop it into the Workout Creator. Here, I did just that. 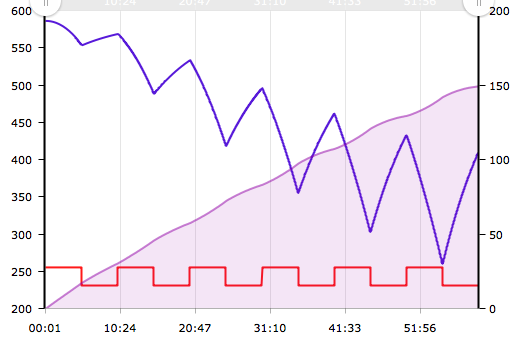 Here, it’s pretty clear that this would be a super-tough workout because that purple line just about hits the red line. But looking at how much (and quickly) the purple line goes down is highly relevant took. At the beginning of the workout, a five-minute effort doesn’t make a ton of impact on the purple line, but it makes a mountain of difference towards the fifth and sixth intervals. This represents increasing fatigue and strain at different stages of a workout– something that TSS tracking doesn’t give you. At a different time of year or for a different athlete, this same workout will have a very different effect. Of course, workouts could be designed exactly the other way around. These so-called “smart workouts” can take your MPA down to a specific level and at a specific rate given your exact level of fitness– and can let you recover the same way too. This means that Xert will calculate exactly how many watts you have to generate for exactly how long to bring your MPA down to a specific level. I’ve found that you can use this information to really dial in your intervals. I think these smart workouts are particularly useful when doing over-under workouts set at a fixed wattage, such as the workout I described above with my watts set at 95% and 105% of FTP for five intervals. Say I want each interval to get me to 95% MPA (that may sound easy but it can be quite hard if you have a tough training schedule). Then I just set the duration of my 105% interval to have a duration that takes me down to 95% MPA and then the 95% “recovery” portion to bring me back to 98% MPA. The following graph shows what Xert says my workout should look like. The first thing you may notice about this workout is the precise times associated with each interval. If I dive into the details, the first interval at 105% FTP is quite a bit longer than the second one (284 seconds versus only 104 seconds). For anyone who’s done hard intervals, this makes perfect sense– you’re always fresher on the first interval so Xert has to make it longer to get you to the same level of fatigue. In the next post, I’ll describe how Xert makes absolutely sure you get to that fatigue level using their highly motivating player. And trust me– having done a bunch of this kind of workout, it sure does feel just as tiring on the shorter intervals as the longer first one. From a coaching perspective, this is absolutely invaluable data to have. The goal of any good training program is to add a specific stress (in the form of workouts) to an athlete’s schedule and, as they recover from those workouts, allow them to adapt and become stronger. But determining how much stress an athlete is capable of depends varies from athlete to athlete. Plus, it’s a constantly moving target based on level of fatigue and where the athlete is in their training schedule. Make the workout too easy and the athlete doesn’t improve enough. Make the workout too hard and the athlete can’t recover fast enough. Using smart workouts, you can create a particular level of stress and use MPA and XSS to tweak the impact on the athlete. An example of how these factors work together may help. Say, for instance, I need 80 XSS points to stay on target with my fitness goal of preparing for an upcoming race. My training schedule calls for maxVO2 intervals but I’m feeling pretty tired because I had a lousy night of sleep. In that case, I might not want my MPA to go below 97% and will want it to go all the way to 99% during my recoveries. Xert can use those requirements to tweak the interval durations to be shorter and the recoveries to be longer. Now instead assume that I’m feeling peppy and well-recovered. I might be daring and set my MPA to go down to 90% during my intervals and go up to only 97% during my recoveries. Lastly, assume that I’m feeling unstoppable and that my maxVO2 workouts have been way too easy recently. Then I might create my own intervals at a high wattage, run myself to exhaustion, and see if Xert detects a breakthrough event– and raises my ceiling to make sure my future workouts are just as challenging. Xert is absolutely fantastic at assessing the impact of interval workouts that include sections at higher than FTP. During portions of a workout below FTP, MPA actually increases. But this isn’t quite right for much longer workouts. For instance, it would be just about impossible for most of us to hold FTP for 90 minutes, because FTP is generally understood to approximate one-hour power. While Xert defines FTP slightly differently (Xert will display a “one-hour power” that is often a little higher than FTP, the numbers are usually very close), holding anything close to one-hour power for 90 minutes would be extremely painful, if not impossible. Yet if you plug in a 90-minute interval at threshold into Xert, the MPA curve stays unflinchingly stable. An utterly impossible workout looks easy. To it’s credit, Xert does measure the overall difficulty of a workout (both with XSS points and duration, as well as an overall “difficulty score”) but these don’t provide the graphical certainty of the MPA curve. But even that difficulty score has trouble with workouts at threshold or below. For instance, when I plug in a workout with two-hours at threshold (which should be impossible), the difficulty only plateaus near 100 points. Bottom line: Xert is great for intervals that are above threshold but not so great for lower-level efforts. Using Xert can be a bit humbling. In my case, I found that my FTP dropped significantly (by over 30 watts!!) 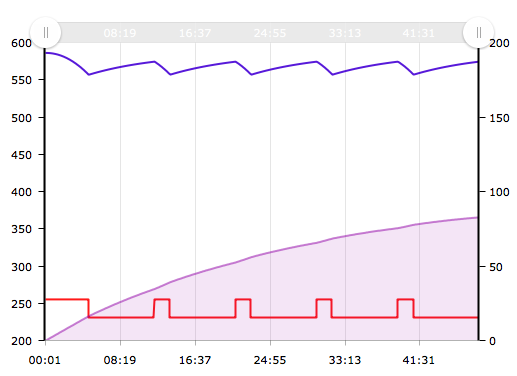 from a normal FTP test I did earlier in the spring. But my data changes slightly on a weekly basis– plus I don’t have to do FTP tests as long as my workouts regularly include some maximal efforts. Just that alone makes Xert worth it for me. But Xert does so much more that it’s a pretty compelling product. In my next post, I’ll talk about how to use Xert with your Garmin cycling computer and Zwift to give you a workout that really makes you stick perfectly to your workout goals.